Once upon a time there was a sales manager. He worked for a store fixture design and build company. This sales manager was a very hard worker who spent a lot of his time trying to solve his clients’ difficult challenges. One day, the sales manager had a lunch meeting with one of his clients. During this lunch, the client told him of a particular challenge which she needed solved. He thought for a few moments, pulled a pen from his breast pocket and sketched out an idea. What happened next was a flurry of activity as the sales manager and his team worked with their engineers to develop a new kind of dump bin. They created a series of 3D renderings to fully explore every possible angle and understand the best ways to insert, remove, move and adjust the various components, and finally created the first in what turned out to be many highly versatile fixtures – and a very happy client. But that’s not the end of our story. This team’s idea is making many other client’s very happy too. The above is a simplified story that illustrates the life cycle of an idea from napkin to prototype. The sales manager was part of the CAP sales team. The challenge the client presented was to create a multi tiered dump display with the ability to be very versatile, multi faceted and fit on a standard 4×4 fixture base. CAP Fixtures used this challenge to create a fixture that can do double duty as a shelf unit and as a dump bin with 3 tiers, adjustable shelves and grids and the ability to modify in up to 16 different configurations. Its an excellent example of a design / build where the customer brings an idea and CAP then designs it from scratch to meet their goal. That unit is now being used in a variety of ways for a variety of clients, each with such different needs an applications that it is hard to tell from one client to the next that its in fact designed and engineered by the same company. It was meant to be a very versatile and cost conscious fixture which replaces three different fixture designs – simplifying planning, increasing merchandising flexibility and allowing for economy of scale in production. In this design all 4 sides are removable. It can be merchandised with or without shelves. With or without the tray insert and with or without the sign holder in the center. 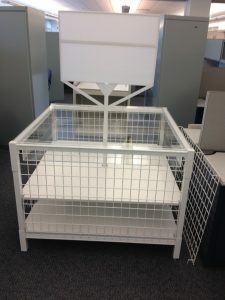 The shelves are vertically adjustable, removable and are stored inside the unit when not in use. CAP clients know the dedication and creativity that the entire team put into their projects. What many don’t know is that every time we innovate, we take those good ideas and we apply them to other challenges. So many best practices and design elements start way before any prototype is made and come out of the close collaborations that we have with our clients. Why not learn what our clients already know – that CAP Fixtures can be your go-to solutions provider for any type of custom store fixture solution – especially when you have a complex challenge. Call our sales team today to hear the rest of the story – (614) 863-3363.